Taking payments is important to keep your business running smoothly. But when it comes to paying for the systems you use to take credit cards, things can get expensive — and confusing. Credit card machine prices vary from $200 to well over $1,000, but there are often additional fees that contribute to how much you pay to use them. The amount you pay for your actual credit card machine is often dependent on its functionality. Credit card processing companies may charge you more for hardware that can process EMV chip cards, accept NFC payments (like Apple Pay and Google Pay), print receipts, or process over Wi-Fi and Ethernet. You may be charged fees to ensure your business is PCI compliant and protected from chargebacks. Those fees can range in size. PCI compliance: Fees to become PCI compliant can range from $1,000 to over $50,000 annually, depending on the size of your business. Chargebacks: Incurred when a customer issues a chargeback for a payment, chargeback fees depend on your processor and the chargeback amount. Each time you tap, dip, or swipe a card, you’re charged a transaction fee, also known as a processing rate. You may be charged additional fees related to the transaction, like batch or interchange fees. Processing rates: The average transaction amount for a U.S. business that processes between $10,000 and $250,000 in annual payments volume is between 2.87 percent and 4.35 percent per transaction, depending on your sales volume, average transaction size, and your card mix. Batch fees: A batch fee might be charged each time you submit a group of transactions to be processed — at the end of a work day, or during a particular period of time. Interchange fees: This fee is charged to cover the cost of the credit risk of processing credit cards. Credit card companies like Visa and Mastercard set interchange fees on a semi-annual or annual basis. Different cards may require different fees, depending on the risk a transaction creates, for example, a debit card may have a less expensive processing fee than a credit card, since there is less inherent risk. There are ways to purchase a credit card machine that don’t cost an arm and a leg. Here are some methods to save money before you make a purchase. Do your research: Before you sign on the dotted line, know exactly what you’re paying for. Understanding what you’re signing up for ensures you won’t be responsible for costly charges in the future. The FTC provides helpful guidelines on things to be aware of when purchasing a new credit card machine. Read contracts carefully: Credit card processing contracts can be difficult to read, and contracts may result in expensive fees if you attempt to cancel. Be aware of contract nuances and cancellation fees before you sign, and fully educate yourself on the commitment you’re making when you purchase a new credit card machine. Reduce your chances of fraud: Purchase a credit card machine that is PCI compliant and is certified to accept EMV payments. This is twofold: You will avoid charges from failing to be compliant, and you will protect your and your customers’ personal and payment information. Without PCI compliance and EMV functionality, you are putting yourself at risk. If you’re on the hunt for a new credit card machine but want a simple, straightforward way to process cards, check out Square Terminal. Square Terminal enables you to accept any form of payment (tap, dip, or swipe) all in one device. It’s optimized for easy, professional, and reliable payments that treat you and your money fairly — with no long-term contracts, added fees, or confusing hardware agreements. Square Terminal sellers pay one low, transparent, fair transaction rate of 2.6% + 10¢ for every dip, tap, or swipe payment, and $399 for the device. 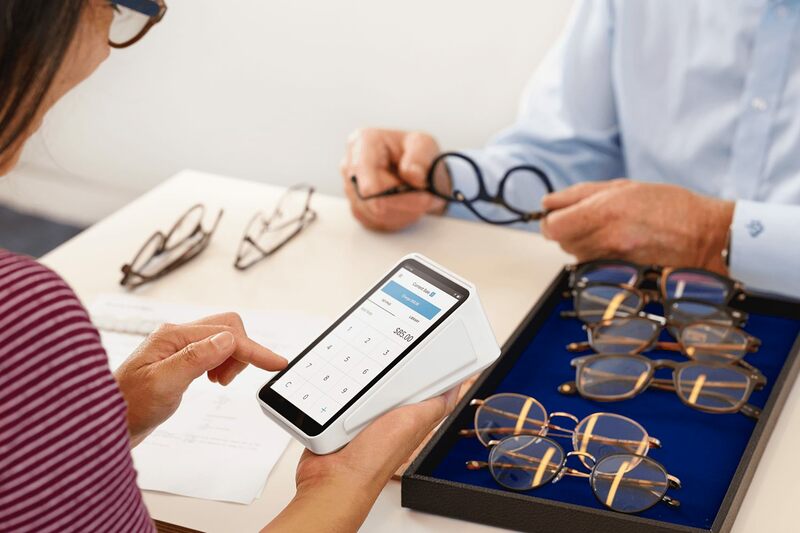 New-to-Square sellers who make the switch pay just $99 for Square Terminal after a $300 processing credit. Sellers also receive 24/7 phone support, a one-year warranty, and the ability to try Terminal risk-free for 30 days. Get your custom, competitive processing rate. Schedule a call with our sales team to learn more.